(CNN) -- Stewart Cink is celebrating winning his first major tournament after clinching a nail-biting play-off victory over compatriot Tom Watson at the British Open in Turnberry on Sunday. 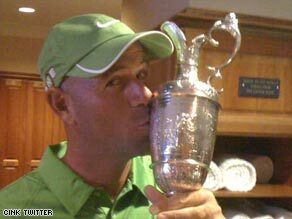 Stewart Cink posted an image of himself with the Claret Jug on his Twitter page. But the 36-year-old golfer from Alabama has also been winning over fans on the internet. Cink, it turns out, is one of a number of high-profile sport celebrities to have turned to the social-networking site Twitter to communicate with his army of fans - and it seems claiming the Claret Jug did not hold back his ability to send regular communiques. His dramatic win on the windswept course in Scotland has now seen his followers number close to 600,000 - all of whom were able to follow Cink's progress to the title as he Twittered his way around the tournament. And - bizarrely - a digital picture of the Turnberry locker-room condom vending machine (This vending machine at T'berry locker room can meet ANY need that arises. 2nd to last one is condoms). Cink revealed early on that he fancied his chances of scooping the prize via the online medium (Best weather I've ever seen in twelve Brit Opens. And best course too. Now back at the room trying to get some air to circulate). He also posted to say that he had chartered a private jet to carry his winning trophy to England for the connecting flight to America with a later update confirming: "Now on board flight back to the States, with one more carry-on than I had on the way over!" Cink joins fellow sportsmen golfer Rory McIlroy, American cyclist Lance Armstrong and British tennis player Andy Murray as regular contributors to the site.